I am writing this in a car full of priests, on the long slog on I-81 through Virginia. There is lighthearted banter interspersed with periods of reflective silence. Each of us stares at his electronic device, or watches a show on the iPad. We pray the Divine Office together as the hours roll by. On the trip up on Monday, we talked and laughed most of the way, enjoying each other’s company. We hadn’t seen each other in a while. Things are a little more somber today. 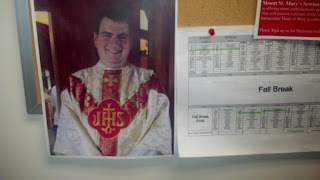 Last Thursday, our classmate, friend and brother priest, Fr. Kevin Kayda, died unexpectedly, just over a month shy of his 28th birthday. I was having dinner when the email from the Rector of the seminary popped up on the phone, and I stared at the screen in disbelief. There followed a flurry of phone calls and text messages with my classmates across the country. Shock, disbelief, speculation. What happened? Services were planned for the following Monday evening and Tuesday afternoon at Fr. Kevin’s home parish, St. Patrick’s, in Carlisle, PA. We were on the horn sharing travel plans, coordinating rides. Two of us suggested that we all gather at the Mount, about 50 minutes away from Carlisle. “It will be good for all of us to be together.” It seemed natural to go back to our Mountain home. On Saturday we got the official notice, that Fr. Kevin had taken his own life. It was like a sucker punch to the gut, even though some of us had suspected this. Kevin was a quiet guy: shy and introverted, but far from being a loner. I remember the first time I talked to him, at dinner in the seminary dining room, in my first year of theology. He had transferred to the Mount from St. Vincent’s seminary, and from the Diocese of Wheeling-Charleston, to his home diocese of Harrisburg. He was not a part of my circle of close friends. We talked regularly, however; he hung out with us, watched movies, went out to meals in Gettysburg and Frederick, shared frustrations and joys. I proofread many of his class papers. He was a regular visitor at our daily post-class Daytime Prayer group, and the lunches that followed, on the patio outside the Caf on sunny days. He was part of the small group of us that shared notes and one-liners, and gabbed regularly on Skype instant messenger. One of our favorite nicknames for him was “Kedar” (a riff on his last name, Kayda), from Psalm 120:5, “Alas that I live in Meschech, dwell among the tents of Kedar!” On my first trip to the Holy Land, during Spring break of my second year of theology, Kevin was my roommate. I found a folder on my hard drive on Thursday. “Kevin – Holy Land Photos.” I remember him with his camera. As soon as we entered any building, it would be out, and he would click away, pointing at every corner, recording every moment, it seemed. There he is, standing in the Dead Sea … atop Masada … on a boat on the Sea of Galilee ... with the Dome of the Rock and the Jerusalem skyline in the background. I went through more photos: our trip to the Holy Land as deacons last December; on my phone, him and his chalice. He was so proud of that chalice! And one of my favorites, our class photo, on the steps of Immaculate Conception Chapel, during our last week at seminary together. In every photo, he has a big smile on his face. Kevin was ordained a Priest of Jesus Christ on June 1, 2013. Sacerdos in aeternum, a priest forever! The photo on his Facebook page will be forever etched in my mind. There he is, in a beautiful chasuble, with a simple red orphrey, beaming with the brightest smile I’ve ever seen, glowing with joy. I saw him last, two weeks later, when we attended the priesthood ordinations for the Archdiocese of Washington at the Basilica of the National Shrine of the Immaculate Conception. In the sacristy, embraces, congratulations, exchanging First Blessings. There’s another photo, he and I, in the parking lot of the Shrine, smiling. I hadn’t talked to him since then. Ours wasn’t a friendship of close and regular communication. Suicide is such a terrible and terrifying reality. What I am experiencing is only the outer edge of the maelstrom of devastation it leaves behind. “Why?” “How come none of us saw this?” “We didn’t know!” “Why didn’t he tell someone?” And, of course, “But, he’s a priest!” I can only barely begin to imagine the pain of those closest to him – his parents, his two sisters, his friends, his parishioners, the schoolchildren at the parish school, his DBs and the priests of Harrisburg. I simply cannot comprehend the mental state which would have lead my friend to take this step. I am at wits end, utterly helpless and unable to grasp it. During the funeral Mass, the cry of my heart was, “Lord, how could you not break into his darkness? How could he not perceive your love, your embrace?” To outsiders, depression is a baffling and mysterious reality. It is also a serious illness. Ordination to the priesthood does not erase of our human burdens and frailty. Inside the programs at the funeral, was an essay by Fr. Ronald Rollheiser OMI on suicide. It was a tremendously selfless, courageous and generous act on part of his family to be open about the cause of Fr. Kevin’s death. On Monday evening, our classmate Fr. Thomas of the Diocese of Lafayette-in-Indiana, preached at the Mass of Remembrance. From all accounts, he did a stellar job. Those of us driving from the south didn’t get to Pennsylvania in time for the services, and offered a Mass for Fr. Kevin on the high altar at Immaculate Conception chapel at the Mount. On Tuesday, our seminary professor, Fr. Larry McNeil, who had been Fr. Kevin’s spiritual director, preached at the funeral Mass: utterly human, searing in its honesty, urging us to trust in the infinite love and compassion of the Lord in a time of incomprehension and grief. The church was packed, overflowing. There were over one hundred priests in attendance. Twenty of the thirty-one surviving members of our seminary class were in attendance. Bishop Walterscheid, Auxiliary Bishop of Pittsburgh, and former pastor of the parish, was the principal celebrant. His heartfelt remarks at the end of the Mass nearly had me break down. He had ordained Fr. Kevin a few short months earlier, and had preached his first Mass in the same sanctuary. Outside, the Salve Regina chanted by all the priests surrounding the hearse, rose up into the light blue of the late afternoon sky. Gementes et flentes, in hac lacrimarum valle. Then, the long procession to the cemetery, his family sitting on the front row, stoic, by the grave. Bishop Walterscheid, after finishing the ceremonies, kissed the casket tenderly, blessed it, and then tightly embraced each member of Fr. Kevin’s family. The Knights of Columbus and the Ancient Order of Hibernians filed by, saluting. I joined my brother priests in touching Kevin’s casket, and imparting one last blessing. 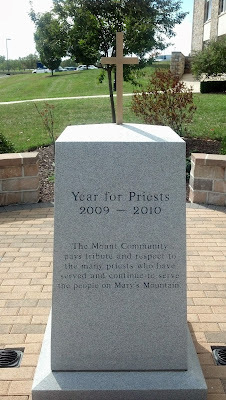 One of the greatest consolations of these past days, however, was simply being back at the Mount, with my brothers. On Monday night, we gathered on the patio after the services, with a fire blazing in the outdoor fireplace (our class gift to the seminary!). We shared memories and jokes, stories from our assignments, and our ministry. Monsignor had ordered pizza. Several cigars were lit, and the seminary bar provided libations. Despite the physical and emotional exhaustion, we stayed up late and laughed and simply delighted in being back together with each other. Behold how good and how pleasant it is for brethren to dwell together in unity! On Tuesday, Burchell and I (well, really, I just helped, Burch did all the hard work) prepared breakfast for our brothers, and we enjoyed the beautiful weather on the patio. Afterward, some visited the Grotto, others went on rosary walks and prayed. After the funeral, many gathered back on the patio again, a bit subdued, bidding farewell to those who had to leave that evening. This morning, Mass offered in St. Bernard’s chapel – the setting of countless hours of prayer and worship during our tenure at the Mount! – and final farewells, before the long drive back south. Each of us, I know, is utterly grateful for the ties to Our Lady’s Mountain, a graced place where we were all formed to serve the People of God as priests of Jesus Christ. And each of us, I know, is grateful to the Lord, for the gift of our brothers, which has, in the midst of grief, rejuvenated and renewed our still young priesthood. 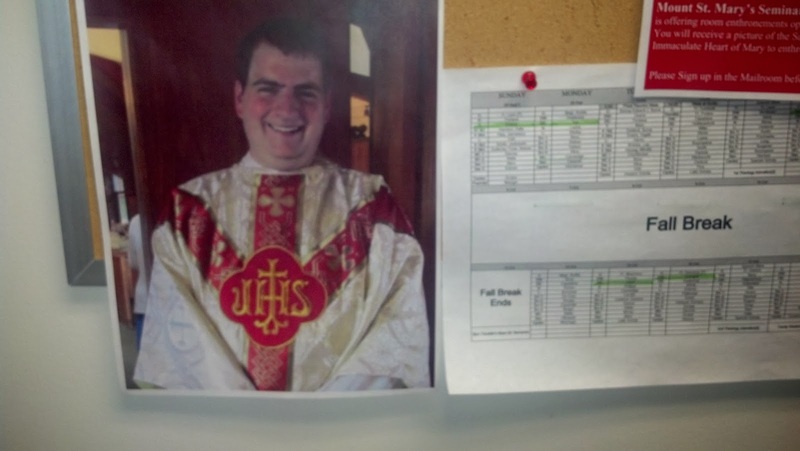 In his four months of priesthood on this earth, Fr. Kevin, I know, gave his all to his people, and offered daily the sacrifice of the Mass, that sacrifice which redeemed the world, and which is a pledge, a promise, of that blessed Kingdom that our hearts yearn for. Dear brother, you were loved so much. You were part of a great band of brothers, disciples of Jesus Christ, on fire with the love of God, who really loved each other and took care of each other, on Our Lady’s Holy Mountain. I pray that you are freed from the torturous burdens that few of us even suspected, and that the sufferings of your time on earth yield to an eternal weight of glory. I pray that in the infinite embrace of the Lord Jesus, the Risen One, you find that peace which eluded you on this earth. Notice of the death of Fr. Kevin Kayda from the Diocese of Harrisburg. Fr. Ron Rolheiser's article, "Struggling to understand suicide." John Jannaro writes a blog on mental illness & suicide, in response to the news of Fr. Kayda's death. "But it is also a time for vigilance. A time to pray for the dead and the living. And also a time to do whatever we can to fight against the stigma that remains attached to mental illness, and to build up adequate, Catholic, Christian, human ways to reach out to people who suffer from mental illness. Let us face the fact:we do not yet have enough of these resources. We're not even close. This must change!." :: UPDATE:: Given the traffic this post is getting, I thought I should include that the family requested memorial donations to the following, if you are so inclined and able. Memorial contributions may be made to Andrew J. Fontanella Parish Activity Center Building Fund, 152 East Pomfret Street, Carlisle, PA 17013 or National Alliance on Mental Illness (NAMI), 2149 North Second Street, Harrisburg, PA 17110. Our son was a classmate of Fr. Kevin's in 6th through 8th grades at St. Pats, and then through their graduation in 2002 from Carlisle High School. Kevin spent a night or two at our house, and I can remember very clearly when he mentioned (in 7th or 8th grade) that he thought he might like to become a priest. And it was such a joy to attend his ordination in June. My husband and I were so very pleased because we just happened to be seated in the area of the cathedral where brand-new Fr. Kevin came to offer us the Eucharist. The following day we attended his First Mass and received blessings from him afterward. My heart felt torn when I realized last Friday morning that the post I saw on Facebook from a young fellow parishioner was referring to Kevin. She asked for prayers for a parish family whose son, a priest, had died the night before. My very first thought was that he must've had a heart attack. But the thought that chilled me and would not go away was that he might've committed suicide. I, too, have a lifelong history of depression. And I have been very, very deep down in what I call "the abyss". Imagine, if you can, being in a place that isn't just dark, it's a place in which there is a total absence of light. And despite how far Down you've gone, you know you're still not at the bottom because you can feel creatures, things, something tugging at you and pulling you further down. I've been in that place while I have sat in the pew at Mass, and sat at my desk at work, and kept a smile on my face for anyone I met. I've been in that place and I've been right on the edge of taking action to make the "awful" stop. In my case, I was distracted by my children coming home from school, or by my husband calling. Please share Kevin's story with others. Please do what you can to make people understand that being suicidal isn't at all like tv or the movies. It isn't all drama and fits. It's more like a quiet whisper in your ear. And please, please, advise any and everyone with a loved one who suffers from depression, to put all firearms in the house in a locked gun safe and do not, under any circumstances, ever tell that person where the key is. It's a step my husband took many years ago, and it's a factor in why I am still here today. My heart goes out to Kevin's family, friends, and fellow parishioners. We all have suffered a deep loss. Where once he held a place in our hearts, now there is a spot of darkness and sadness. I also thank you for your post. One of my younger brothers took his life seven years ago. I thank God that I am part of a religious community that knew how to support me and let me be open and honest. “For God sees the whole man, and He has a tender way of looking at a soul at its highest, not its lowest. He does not do as we so often do, misjudge it because of what its diseased mind made its body do in a blind and broken hour. And we have to do with a Love that can grasp the poor hands that reach out to Him in that darkness–what father would not do that? And He is our Father." May God continue to bless you in your priesthood. Friends of mine wish to have Gregorian Masses said for Fr. Kevin...30 consecutive days. At this point we have not made arrangements but wondered if Father's classmates have already done so and if not is it possible for each of you to do 5-10 days each...? Another idea that came to me was to all to offer your Mass for him on the month's mind (30 days after his death)...both are beautiful traditions and are a way of remaining united in love and prayer for him. Thank you Father. Thanks to all for the comments. Peggy: I know that all of us said several Masses for him in the days after his death. We have not talked about anything since. I was going to suggest a Month's Mind to the class. It's not a custom very well known, it seems, here in the U.S., though it's very common in India and elsewhere. The problem is this, Peggy -- all of us are junior parish priests, and we have commitments to Mass Intentions from our parishioners first. I am sure all of us say Masses every day, even when we do not have the parish Mass, but most days, I suspect, we all do. So it is difficult to take on a Gregorian commitment as you suggested. Fr. Kevin's Month's Mind will be on a Sunday, again, which is problematic given parish intentions. I am able to say one because I have a separate non-parish Mass that I'm doing that day. It's easier for Order priests, monasteries and the like to take up such requests. I will, however, pass on the Month's Mind suggestion. Thank you so much for this in-depth sharing, Father G. I am moved to tears. May he RIP! I am Father Kayda's mother. We had a series of Gregorian Masses said for him per his wishes. They started on October 14th and will finish the day before his birthday, which is November 13th.